Nowhere in the world is shariah more contested (yet seldom debated) than in war-weary Somalia where each of the entities competing for power claims to have embraced it while condemning its detractor, or rather, its enemy, as a dangerous imposter. It depends. If by shariah we mean the Talibanesque, self-righteous, and unjust brand currently being practiced by the Somali neo-Islamists known as al-Shabab and Hizbul Islam, the answer is no. As these two groups have been asserting their authority through violence-driven territorial expansion, they have been rapidly loosing the public confidence necessary for them to sustain any gains. Horrific accounts attesting to their ignorance and to the cruelty of their method have been stirring panic and cultivating hate. Stories such as the two neo-Islamist assassins who followed their victim into a mosque and prayed alongside him only to shoot him in the head after he stepped outside the mosque raise serious questions regarding these groups' understanding of Islam and shariah. Theirs is an obtuse, if not dysfunctional, interpretation of shariah. They are oblivious to the education-based societal transformation that the classic shariah seeks to achieve. To them, shariah is a purposeless, uncompassionate, punishment-driven set of laws that are arbitrarily implemented without consideration of time, circumstances or objectives. It is a matter of time before the masses conquer their collective fear and revolt against this unaccountable, selectively oppressive, and entirely alien brand of shariah. If, however, by shariah we mean the classic concept of Islamic governance adapted to address contemporary political, social, economic, and spiritual challenges in a just way, the answer is yes. For a country whose national institutions have been utterly destroyed and almost all threads that once wove its society together have been unraveled, in Somalia Islam is the only thread that remains intact. Therefore, adopting shariah as a set of rules, regulations, and values to govern Somalia is not only feasible but perhaps the only sensible means to resuscitate that dying state. Somali people are desperate for a government and indeed a system of governance in which they can invest their trust, one that protects them against injustices and guards their right to own property, enjoy basic freedoms and exercise their freewill. To begin to address this, President Sharif Sheikh Ahmed and his government would have to identify the most crucial needs of the people. Granted, in a number of his speeches while visiting the Somali Diaspora in the United States, he highlighted security, humanitarian needs and capacity building as being his top priorities. While no one would dispute the importance of these three, some question why peace and reconciliation are not part of these top three priorities? They argue that there should be an ongoing process that resists any temptation to give up prematurely. The model of shariah that is likely to succeed is one that genuinely addresses the following needs as well. 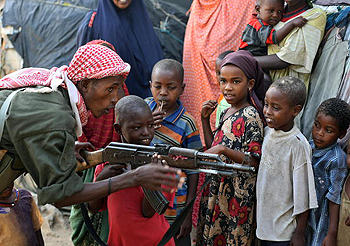 • Preserving the sanctity of life and the provision of a secure environment in which the average Somali could reach his/her optimum potential. Within this, protecting the lives of civilians and addressing the humanitarian crisis reign high. • Instituting a peace and reconciliation policy that would keep the door open and the peace process in motion. • Protecting individual properties against any abuses, including nationalization and state properties by establishing a transparent system of accountability. • Instituting policies that guarantee equality before the law and protect the rights of women and minorities. • Protecting individuals from power abuse and preserving individual's honor by protecting him or her against false accusations, imprisonment, slander, and character assassination. • Protecting freedom of assembly, conscience and thought. • Promoting education and protecting the right of the individual citizen to question and scrutinize their leaders and protecting their right to elect representatives. • Enacting policies promoting ethical and moral conduct that, among other things, criminalize favoritism and other corruptions such as bribery and nepotism. • Paving the way for the development of independent institutions that, on one hand, ensure a system of checks and balances and, on the other, enhance the overall function of the government. • Instituting policies that protect the sovereignty of the nation and promote neighborly coexistence with neighboring states and with the rest of the international community. President Ahmed must succeed in persuading people to accept the legitimacy of his government and to trust the individuals appointed to exercise that authority. In order to achieve that, those entrusted to lead must resort to taking tangible actions that would restore law and order and improve the lives of people. They must do away with the clan-based quota system that by and large appoints incompetent demagogues who neither serve the nation nor the clans in whose name they were appointed. More importantly, they must streamline all the militias led by shrouded warlords who are now considered government allies into a disciplined army that is accountable.